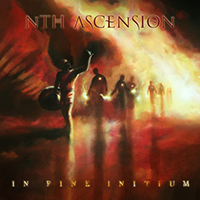 After my review of the second Darrel Treece-Birch solo album “No More Time”, it is now time for the new and third album “In Fine Initium” of the keyboardist's Progressive Rock Band Nth Ascension. As you could read in my previous review the music that Darrel is making on his solo albums is in a more Ambient Progressive vein and therefore could also be appreciated by fans of Ambient and New Age music. The music of his Progressive Rock vehicle could be described as Symphonic Neo-Prog. So you can expect heavier guitars, a tighter rhythm section with quick time-signatures, long lush keyboard carpets and soaring guitar solo's. This band knows how to (Prog)rock. The album consists out of seven tracks. The last three of them are the sequels of the first three “Clanaan” parts you could find on the predecessor “Ascension Of Kings”. So you can find the parts “Clanaan Pt IV”, “Clanaan Pt V” and “Clanaan Pt VI” on this album. It is about a conceptual fantasy story that was developed way back in 1987. In this chronicle we embark on a journey to find the rider who is said to bring balance and harmony to the realm, restoring the chord of creation. The album opens with the first epic (15 minutes) of the album entitled “Kingdom Keys”. After an up-tempo opening with lush keyboards and melodic guitar parts singer Alan (Spud) Taylor is bringing the first vocal melodies. He has a distinct voice and you maybe have to get used a little bit to his voice, but I can assure you he is a great vocalist. “Kingdom Keys” is a great epic full of melodic and freaky synth solo's, aggressive rhythm guitar parts and great drumming on a bed of symphonic keyboard layers. The band brings this opener with a lot of passion and tension. The lovely vocal melodies are bringing some relief and gives this piece the so needed diversity. The second track is called “End Of Days”. Another eleven minutes of burning Symphonic Rock. This band knows how to (Prog)rock. If you were listening to this album in a record store you probably already made the decision to buy the album. Even before you had heard the real highlights of this remarkable album. In the last part of this song the band is slowing down a little bit with beautiful and melodic guitar work on those broad keyboard orchestrations. The next track “So, That Was The Apocalypse” is more a mainstream Rock piece with some blues influences. I like the Hammond organ but to be honest, this is not my cup of tea. But now we have reached the very strong second part of the album with only highlights. It all starts with the seventeen minutes long epic “The Cage”. This epic has even a greater diversity by the use of several rhythm changes and delicate instrumental parts. The last part of the song is great. Slowly the tension of music is building up towards a climax. Singer Alan (Spud) Taylor is shining in this track. “In Search Of The Rider: Clanaan Pt IV” and “Forever: Clanaan Pt V” are for me the absolute highlights of this album. You can find delicious melodies and very strung vocal parts in Pt IV. And in the instrumental Pt V you can find a minutes long soaring guitar solo on a bed of lush keyboard orchestrations. When I heard the soaring guitar solo for the first time I had to think of the work of guitarists like Nick Barrett (Pendragon) and Steve Hackett. This is my favorite piece of the album and the reason that I asked the band for a physical promo copy of “In Fine Initium”. What an amazing piece of music that goes straight for your hart. Only for this track you have to buy this album! The album closes with the slow “When The Rain Falls: Clanaan Pt VI”. Delicate sung vocals accompanied by a tasteful guitar part. A worthy ending of a remarkable album. Reading the above you can imagine that the band Nth Ascension can add another member to their fan base. If you like old school Symphonic Rock / Neo-Prog this is your album. The music is maybe not so innovative or progressive ... but I just love this kind of keyboard drenched Symphonic Rock with soaring guitar solo's, great vocals and a steady rhythm section. The band is a powerhouse and I would love to see this band in a live setting. I want to thank the band for signing my copy of the album. The third album “In Fine Initium” of Nth Ascension is highly recommended by progVisions.